The US men’s national soccer team (USMNT) is playing out a strikingly similar transition. Soccer lacks timeouts, scripted plays, walks to the mound, and other opportunities for coach involvement. In the past (granting notable exceptions) Americans have struggled to convert size, speed, and fitness into consistent success against quality opponents. The greatest player alive is 5’7″, 150 lb., and not particularly fast. Physical attributes help, but top-level success requires ball skill, speed of thought, creativity, and playing to game conditions without benefit of active coaching. So transition from “coached” to “creative” is key. That transition is remarkably similar to transition from waterfall’s “directed” to Agile’s “self-organized” team. 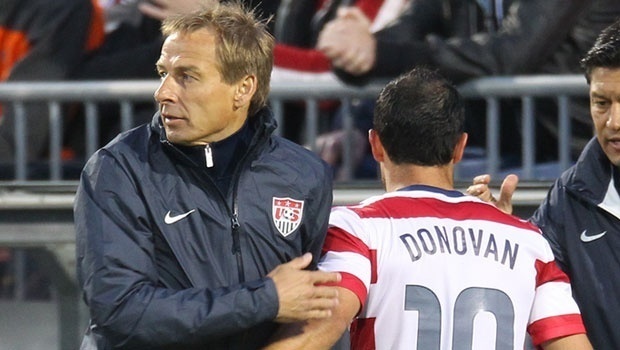 In August 2011 Jürgen Klinsmann was hired as coach of the USMNT, and he seems to be working the transition well. The team is on a run of success, with an unprecedented 12 straight wins, including victories in friendlies (exhibition matches) against Italy, Germany, and others, and recapture of this region’s Gold Cup championship. The points that open this post are what I’ve observed as Klinsmann’s method. Let’s review each point to see what he’s doing and how it compares with what you can do in your transition from waterfall to Agile development. While previous American coaches lacked top-level experience as players, Klinsmann is literally a soccer rock star. He scored 47 goals in 108 appearances for the German national team, which he captained for four years. He was a World Cup winner with Germany in 1990. His club experience reads like of a roundup of top teams in England, Germany, and Italy. He was twice awarded German Footballer of the Year. It is no wonder our national team players listen to what he has to say. Do you need to be an Agile rock star to help your team transition? No, but your transition will struggle without someone serving as a qualified representative from the destination. In a successful transition I witnessed firsthand, the scrum master was fairly new to the Agile world but established credibility with hard work, depth of Agile study, and dedication to the transition. If you aren’t experienced with Agile methods, and don’t have access to a gifted newcomer, then hire an experienced consultant with strong qualifications as scrum master. In public Klinsmann expressed unwavering confidence in the team. Maybe behind closed doors he held on to his position of teaching concepts rather than instructions, and expecting players who understand the concepts to execute on them in game conditions. That’s exactly what you’ll need for your Agile team to operate effectively. Screw-ups are a byproduct of building creativity, so you’ll need to provide a safe place for them. Klinsmann seems to give his players lots of latitude for mistakes. For example, this summer young midfielder Brek Shea was replaced after a horrible first half in a tournament game. Midway through the second half of the next game commentators were surprised to see him subbed in. He scored in that game, and returned in that tournament’s final as a sub to score the winning goal. After the bad half many were surprised that Shea wasn’t just shipped back to his club team in England. Maybe that would have been reasonable, but after that experience would Shea have been motivated and confident in his next US team outing? I bet he is now after scoring two critical goals. It may seem strange to reward someone for making a mistake, but it’s the intent behind the mistake that counts. An empowered Agile team consists of motivated, confident, creative members. They became that way by screwing up and learning from the experience. You will need to recognize learning potential and attitude, and skillfully manage situations to maximize team members’ confidence, just as Klinsmann did with Shea and others who succeeded after going through hard times.